Today my guest is Chris Graham. Chris is the President of MoreBeer Inc which is one of the largest online home brew suppliers, and he also is an instructor at the world renowned Sibel Brewing Institute. 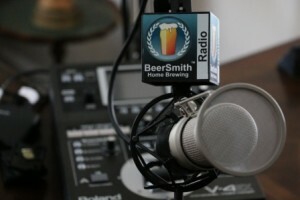 Chris joins me to discuss larger scale (10 gal/38 l and above) home brewing systems including RIMS and HERMS systems as well as associated pumps, chillers and other accessories. Chris shares a few of the new projects and developments at MoreBeer. We open with a discussion of why home brewers often move up to three tier RIMS and HERMS brewing systems as they move from 5 gal (19l) batches to 10 gal (38 l) or larger batches, as well as why a pump is often added at this point. He explains the basic three kettle (three tier) system consisting of a hot liquor tun, mash tun and boil kettle. We talk about the use of insulated vs non-insulated mash tuns and how the control of temperature during the mash often differentiates these systems. Chris explains the basics of a recirculating mash system which is used to maintain a constant temperature by recirculating hot wort past a heat source during the mash instead of using insulation. We discuss the simplest mash system which is a RIMS system – it uses a separate heat source to directly heat the recirculating wort. The other major mash system is called HERMS and typically uses a coil in the hot liquor tun to heat the recirculating wort. Chris explains how this works. We also discuss Kettle RIMS which is a RIMS hybrid using a boil kettle (such as my BrewEasy) and also direct fire systems that heat the mash directly while recirculating the wort. Chris talks about how various control systems including PIDS and Microcontrollers are used to monitor and control the mash temperature during recirculation. Next we discuss wort pumps including the two major manufacturers of pumps and the type most commonly used in home brewing. The pumps also come in handy for a variety of other uses including transferring wort, chilling wort and even cleanup. Chris explains why immersion chillers are not a great choice for large all grain systems and how most brewers switch to a plate chiller or counter-flow chiller. He talks about what a typical brew day might look like on one of these all grain systems. Finally Chris spends a minute talking about some of the new things going on at MoreBeer.